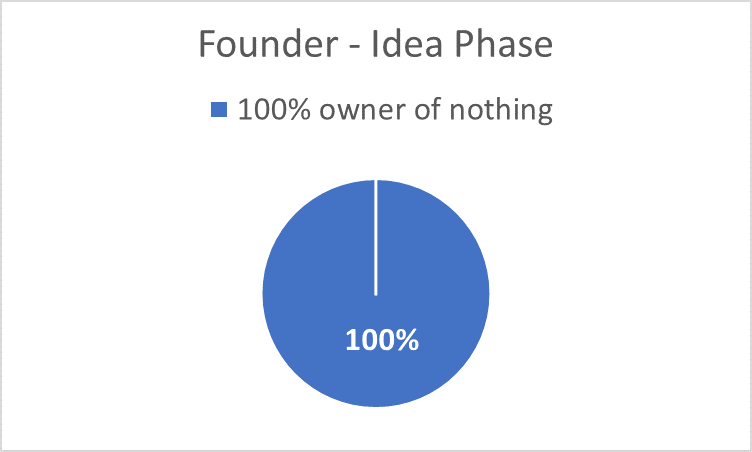 How Startup Funding Works? | Veristrat Inc. The term “startup” has been the most renowned word around for the last few years. It’s all about an idea to make a concept, which sooner or later becomes the business enterprise. You as an entrepreneur acts as the most important person who has to continue through many stages before attaining the top i.e. “The IPO”. Startup funding seems a difficult task, however it is not. All you need to understand is whom to contact and at what stage of the startup process. So, let’s move on and try to understand how startup funding works. Each and every funding in your company will have a cost. You will have to give up a piece of your company. More funding means more you give up and dilution of ownership. Let’s take a hypothetical scenario to understand the startup funding journey – “from an idea to become an enterprise”. Life changing moment for the founder. You believe in your idea and think that sky is the limit for you. Is this possible? Yes, however, you need money and you need people for sure. Bootstrapping could be an option, if you have saved enough to manage day to day operations, employee cost, marketing cost and many of such costs. The initial capital may vary depending upon the business you start with. Let’s say you start with $10,000. This is very little amount to start with and only a kick start is possible, however, running a business is not possible and sooner or later you will be looking for a partner. As soon as you start working on your idea and try to transform your idea into a real world, you realize that it is taking you longer as usual. You know you could really use another person’s skills, so you look for a co-founder. 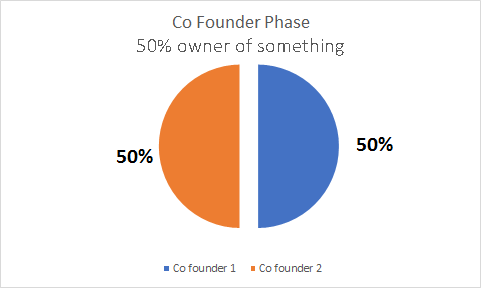 You will have to offer 50% ownership and can expect an equal contribution from a co founder, so that you would be able to upgrade to next level of technology, more investment in marketing and can capture more customers. First thing first gets your company registered. Suppose you both issued 10 lakhs of common shares for yourselves and divides equally. Now, from nothing you are the owner of 50% shares of a company. 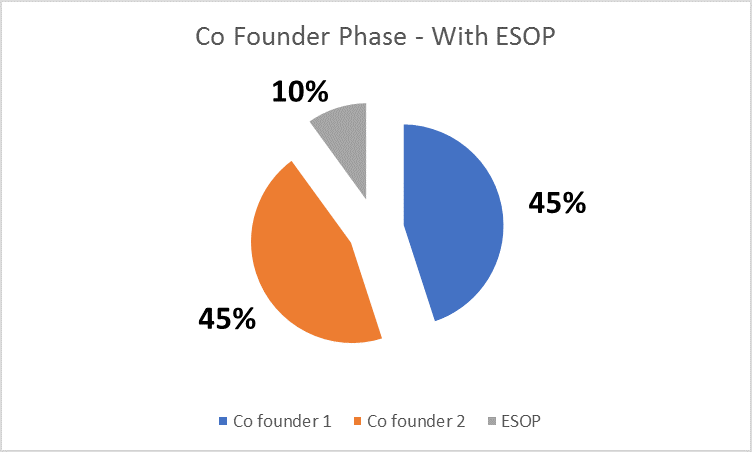 It is also the time to set aside a specific percentage of company’s stock in the form of option pool (ESOP), which will help further in your worst time. Now as company is growing, you and your co founder will realize soon that for further growth more and more funding is required. You with your partner have already invested your own money and you know that debt/bank loans is the cheapest source of money, so you will approach various bankers and will realize soon that rarely any bank will entertain you and your idea until unless you are a celebrity or a very well-known person. So now to approach and convince some of rich friends and family members to invest in your idea will be better. You need to make sure that this whole process must be formal. 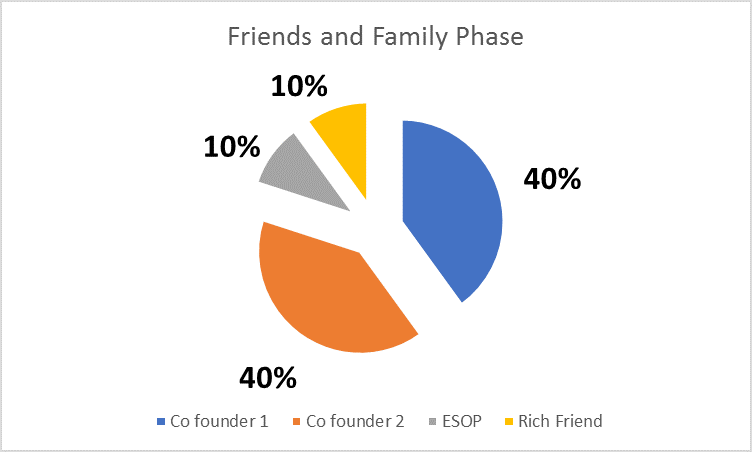 As, new preferred shares are to be issued to the friends/family members, the total value of the company will shoot up and hence you will end up with a lesser percentage of a bigger pie. Suppose one of your rich friend is ready to invest $ 50,000 in exchange of 10% equity shares. That means your friend has seen potential in your idea and valued your company at $ 500,000. Here is how your equity will dilute. Now with the money invested by your friends/family members you will be able to make many things more comfortable. Should you feel happy and dandy at this moment? Yes, you can, however, the money invested by your friends/family members will not last for lifetime. You have to move forward from an idea stage and working in a real world. Now it is the time to go for real growth and expansion. You have some real numbers to show, skillful employees to flaunt. In short, you are ready to compete with Angel financing. Now suppose you have convinced angel at a valuation of $ 2 mn and he/she agrees to give you $ 0.4 mn, so would it mean he/she gets 20% ownership in equity? In general, No! It depends as generally Equity is decided on post-money valuation not on pre-money valuation. This will be applicable to each stakeholder and everybody’s share will be diluted by 1/6. Finally, the time has come when you will be looking for big investors as Venture capitalist/Private Equity. You need some big funding for further growth, expansion, R&D etc. Now the big question is how much funding can VCs provide you? Let’s say that VCs has done valuation of your company and valued it worth $ 4 mn. 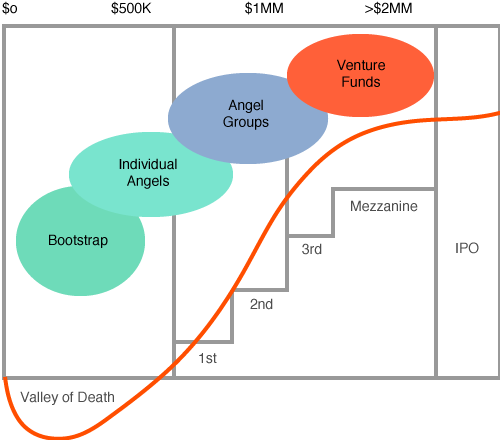 Like angel funding, it is your pre-money valuation. He/she wants to invest $ 2 mn. The calculation is exactly the same as in the angel round. 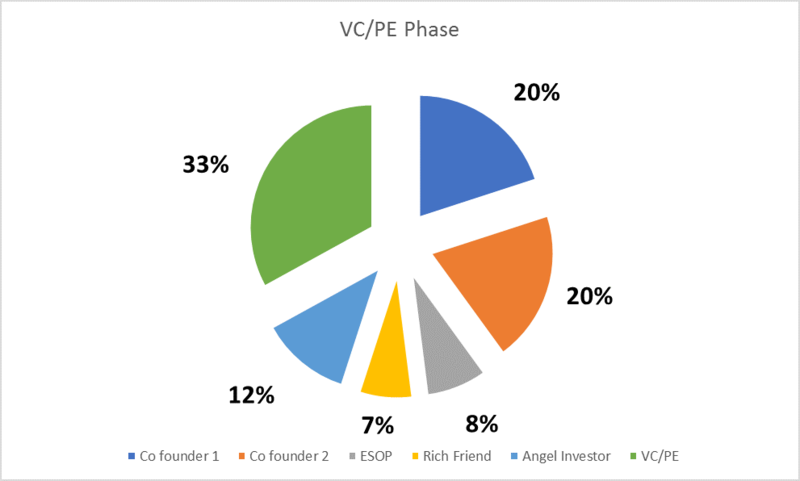 Per post money valuation VCs get 1/3 and everybody’s share will be diluted by 1/3. Now it’s VCs Company, too. You will notice that post every funding done, your ownership gets diluted. Is dilution really bad? It depends. No, because the size of your company is getting bigger with each funding round closed. Also, yes, because with every investment you will certainly lose control of your company. So, what can you do? Go for investment only if it is necessary and take investment from people you respect and who understand you and your business. 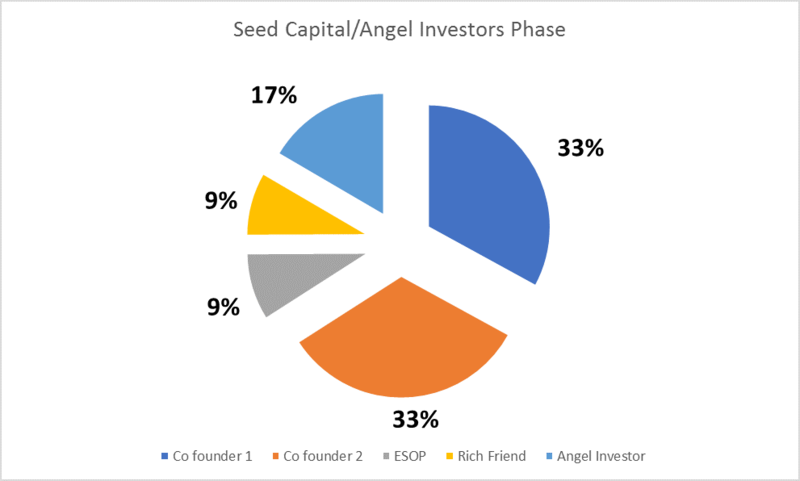 Let’s say first round of VCs as series A and you can go for further rounds as series B, C, D and so. However, a startup cannot get funding from various investors forever. After some round of funding closure, at some point either of the four things will happen to you. You will get enough funding that you will be a big player in the market and any of the bigger companies may acquire you. Or after many funding rounds, your company does so well that you decide to go public and looking for an IPO. Or after many rounds of funding you will not achieve real growth and no one wants to invest in your company, so you will file for bankruptcy. Finally, the case can be in which you decide to be private for some more time and will be in search for next round of funding.